Blaze Pizza, 1737 Sherman Ave. Blaze co-founder Elise Wetzel (Weinberg ’87, Kellogg ’92) said she thought of the concept while eating at a Chipotle in Pasadena, California. Elise Wetzel was in a rush when she stopped by a Chipotle in Pasadena, California. She’d been craving pizza, but couldn’t think of a place that combined both speed and quality ingredients. Wetzel is the co-founder of Blaze Pizza, a nationwide fast-casual pizza restaurant that has grown in popularity. The Northwestern alumna founded the chain in 2011 with her husband, Rick Wetzel, who co-founded Wetzel’s Pretzels. Blaze uses high temperature pizza ovens to ensure a crispy crust and cut down cooking time, she said. Wetzel said entering the pizza business was an “audacious goal” considering the large number of local pizzerias and national delivery chains. Because of this, she said, she had to find a “niche” for her new concept. 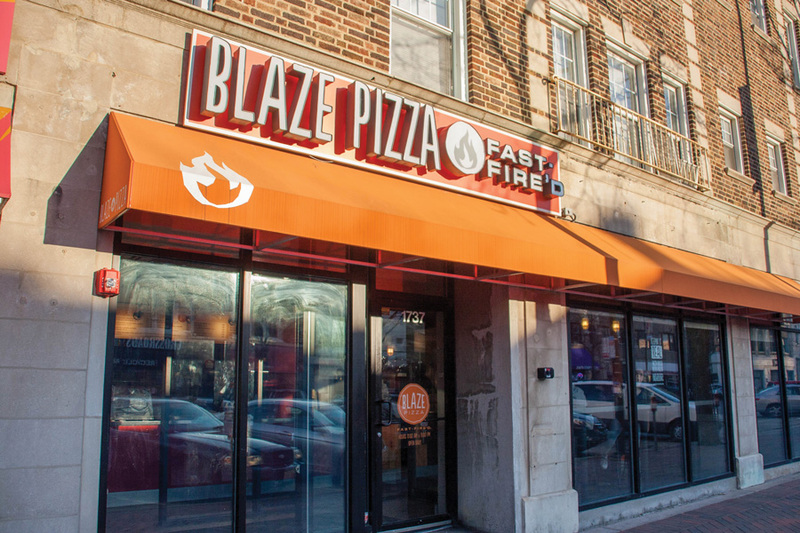 Larry Levy (Kellogg ’67), founder of a group developing Blaze Pizza in Chicago, called Blaze a “revolutionary concept in pizza.” The current Northwestern Board of Trustees member is the “engine” behind Blaze in Chicago, Wetzel said. Levy said it was easy for him to get on board with Blaze’s concept, calling Elise and Rick Wetzel “visionaries” in the pizza business. Though Blaze does not fit the mold of a traditional, Chicago-style pizza, it has been received well in the area, Levy said. There are roughly 15 Blaze locations in the area, Levy said, including one in Highland Park that opened earlier this week. Now in its sixth year, Blaze has more than 185 locations throughout the United States. Wetzel said she tries to attend as many store openings as possible, but one in particular had special significance. Although Wetzel said the opening day in early spring was unseasonably cold, students and Evanston residents formed a line down the block. “It was so exciting to see people get it so quickly, to understand what Blaze was,” she said. Wetzel said her favorite part about NU was involving herself in non-academic clubs and organizations. During her time in college, Wetzel was involved with A&O Productions as well as her sorority, Alpha Chi Omega. One of her closest friends, Jennifer Sant’Anna (SESP ’87), said the two met through their sorority freshman year. Sant’Anna is now the vice president of operations for REV sustainability, a consulting group. She recalled being at Wetzel’s wedding and hearing the newly-wed couple discuss a business idea they had in the works. That business idea would later turn into Rick Wetzel’s business, Wetzel’s Pretzels. “They’re curious and they’re generous of heart and mind, they’re just very smart people,” Sant’Anna said. Wetzel, who majored in economics and earned a minor in the School of Communication during her time at NU, credits Northwestern’s lack of a “traditional” undergraduate business program with giving her the ability to explore different fields of study.